Every true fan of piquant tastes will never ever start a barbeque or grill without having chilli, hot paprika, black pepper and ginger on their hand. In order to satisfy the needs of the true piquant-taste fans, we have added sweet paprika, dried onion and salt into the mix so as to intensify the grill taste - without any artificial taste enhancers. The most practical solution, the richest taste! Packet contents is sufficient for about 5 kg of meat. 1. 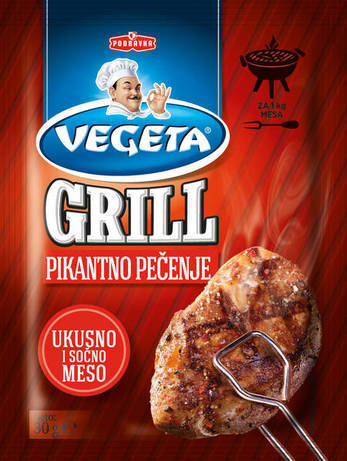 Sprinkle the meat with Vegeta Twist. 2 Let stand for about 30 minutes. 3 Fry in a pan, on barbeque or grill. Table salt, spices 32 % (garlic, chilli, hot paprika, black pepper, sweet paprika, ginger), dried onion 15%, sugar. May contain sugar. Storage: Keep in a dry place at room temperature.